Product prices and availability are accurate as of 2019-04-06 17:36:50 EDT and are subject to change. Any price and availability information displayed on http://www.amazon.com/ at the time of purchase will apply to the purchase of this product. 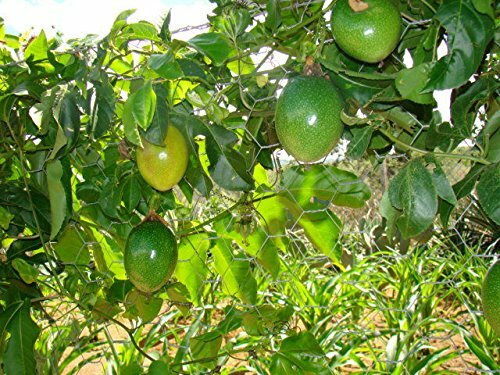 Zone: 9 to 11 Growth Rate: Fast Plant Type: Evergreen Twining Vine Family: Passifloraceae Native Range: Brazil through Paraguay to northern Argentina. Height: 10 to 25 feet Spread: 3 to 6 feet Bloom Time: Mid Spring Sun: Full Sun to Part Shade Fall Color: Evergreen Drought Tolerance: Low Water: Medium Maintenance: Medium Site Requirements /Soil Tolerances: Passion fruit vines grow on many soil types but light to heavy sandy loams with a pH of 6.5 to 7.5 are the most suitable. Excellent drainage is absolutely necessary. Also, the soil should be rich in organic matter and low in salts. If the soil is too acid, lime must be applied. Because the vines are shallow-rooted, they will benefit from a thick layer of organic mulch. Culture: Pruning is necessary to keep the vines within bounds, to make harvest easier and to keep the plants productive by maintaining vigorous growth. In warm winter climates prune immediately after harvest. In areas with cool winters prune in early spring. As a a general rule remove all weak growth and cut back vigorous growth by at least one third. In very hot climates allow a thick canopy of foliage to grow around the fruit to prevent sunburn. Uses: The vine can be rather rampant, so it is important to plant it next to a chain link fence or install a strong trellis before planting. The plants can also be trained into an attractive arbor. Typically grown in tropical gardens or greenhouses for the exotic beauty of its flowers and edible fruits. 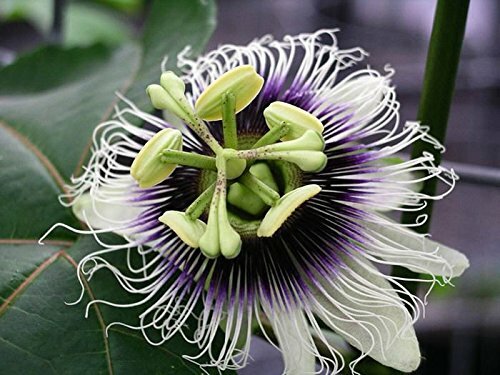 Sowing Passiflora edulis Seeds: For best results, please follow the instructions in the order provided. Scarify: Soak in water for 24 hours Stratify: None. Germination: Sow 1/4" Deep, Keep warm (70-75 degrees F) and moist (Not wet). QTY: 20 SEEDS Other Names: Passion Fruit, Granadilla, Purple Granadilla The Purple Passion Fruit, native from southern Brazil through Paraguay to northern Argentina, is a vigorous, climbing vine that clings by tendrils to almost any support. It can grow 15 to 20 feet per year once established and must have strong support. It is generally short-lived (5 to 7 years). 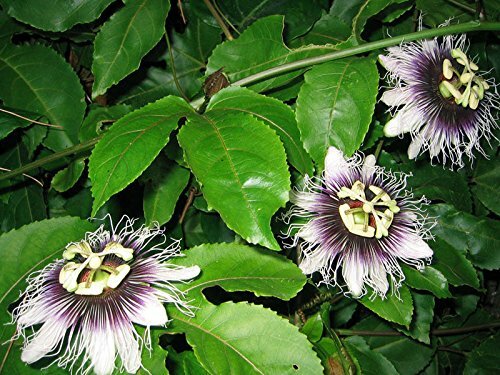 The evergreen leaves of Purple Passion Fruit are alternate, deeply 3-lobed when mature and finely toothed. They are 3 to 8 inches long, deep green and glossy above, paler and dull beneath and, like the young stems and tendrils, tinged with red or purple. A single, fragrant flower, 2 to 3 inches wide, is born at each node on the new growth. The bloom, clasped by 3 large, green, lifelike bracts, consists of 5 greenish-white sepals, 5 white petals and a fringelike corona of straight, white-tipped rays, rich purple at the base. It also has 5 stamens with large anthers, the ovary and triple-branched style forming a prominent central structure. 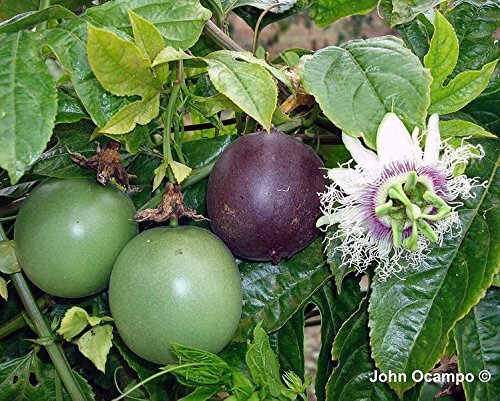 Purple Passion Fruit is self-fruitful, but pollination is best under humid conditions. Carpenter bees are the most efficient pollinator, much more so than honey bees. Wind is ineffective because of the heaviness and stickiness of the pollen. The flowers can also be hand pollinated. The nearly round or ovoid fruit, 1-1/2 to 3 inches wide, has a tough rind that is smooth and waxy and ranging in hue from dark purple with faint, fine white specks, to light yellow or pumpkin-color. Within is a cavity more or less filled with an aromatic mass of double walled, membranous sacs containing orange-colored, pulpy juice and as many as 250 small, hard, dark brown or black, pitted seeds. The unique flavor is appealing, musky, guava-like and sweet/tart to tart. The yellow form has generally larger fruit than the purple, but the pulp of the purple is less acid, richer in aroma and flavor and has a higher proportion of juice (35-38%). The vine, especially the yellow form, is fast-growing and will begin to bear in 1 to 3 years. Ripening occurs 70 to 80 days after pollination. 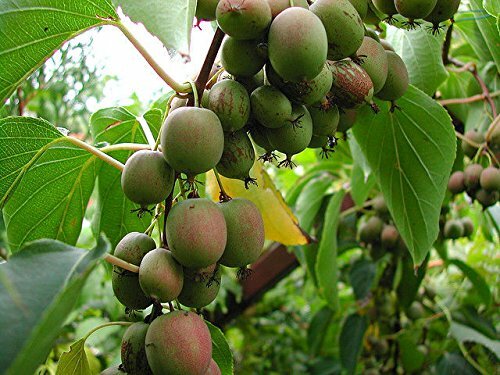 The fruit will quickly turn from green to deep purple (or yellow) when ripe and then fall to the ground within a few days. They can either be picked when they change color or gathered from the ground each day. 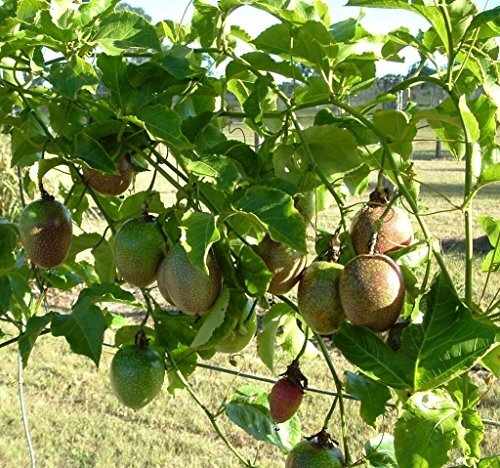 To store passion fruit, wash and dry them gently and place them in bags. They should last 2 to 3 weeks at 50° F. The fruit is sweetest when slightly shriveled. Both the fruit and the juice freeze well. The flavor of passion fruit blends well with citrus and many other fruit flavors and is quickly appreciated by many people as they become familiar with it.